Nothing says good morning like the smell of freshly baked muffins. And its even better when you get more of the top. After all, who doesn't love eating the top of the muffin only? With the Cast Iron Muffin Toppers Biscuit Pan you don't have to throw away the bottom of the muffin ever again. The cast iron promotes even heat distribution leaving the perfect golden brown muffins every time. Aebleskivers are a traditional Danish food somewhat similar to American pancakesand a great new family tradition for your own home. Fill the pan with whatever ingredients you love; try pancake puffs, mini cobblers, savory egg dishes, and more. You'll be delighted with the fun foods coming from your aebleskiver pan. Plus, our preseasoned cast iron is easy to cook with and maintain. Grab one for your kitchen today. Enlighten your dinner guests with an added western flare to your meal. This Cast Iron Western Corn Bread Pan is perfect for any traditional meal. Molded with a unique saguaro cactus shape, this pan is a great addition to any cast iron collection. Preseasoned with Camp Chef's True Seasoned Finish this pan has a natural cooking surface that is ready to cook on out of the box. 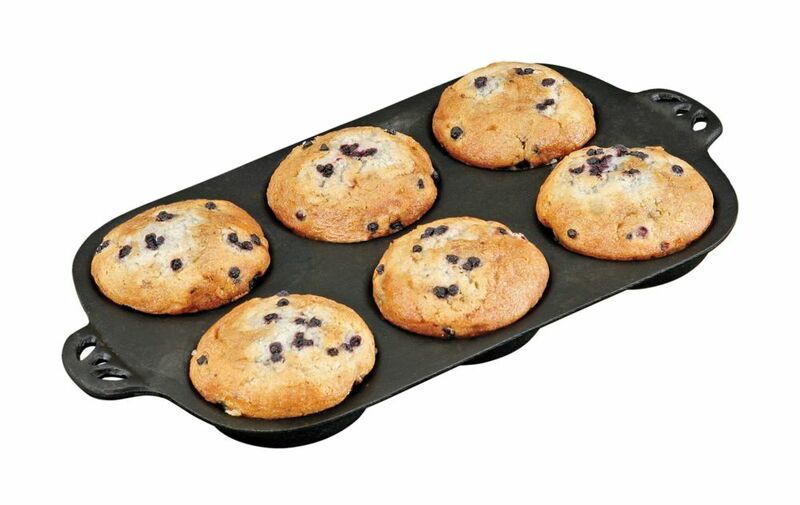 Cast Iron Muffin Top Pan Nothing says good morning like the smell of freshly baked muffins. And its even better when you get more of the top. After all, who doesn't love eating the top of the muffin only? With the Cast Iron Muffin Toppers Biscuit Pan you don't have to throw away the bottom of the muffin ever again. The cast iron promotes even heat distribution leaving the perfect golden brown muffins every time. Cast Iron Muffin Top Pan is rated 5.0 out of 5 by 1. Rated 5 out of 5 by Jackie farmstead cheesemaker from Quality muffin pan holds up over time I was excited to finally find a heavy good quality muffin topper pan that wasn't "non-stick" coated. It heats very evenly and cooks to perfection. Besides cooking muffin toppers nicely, it makes the best hamburger buns. The crust is wonderful and they turn out like the buns from a gourmet burger restaurant. This is a must have item for fabulous grilled burgers all summer long.